Weekend Dating was founded in 2003. Our events have resulted in over 65 marriages and over 10 children. We love what we do and want you to be our next happily ever after story. Our events are exiting and dynamic. We offer speeddating, trivia nights, cultural events and much more. Our Long Island Speed Dating, NYC Speed Dating and Queens Speed Dating events are a great way for NY singles to meet. Proof of age required! The main difference between us and others is how the events are run. We typically are told time and time again about the organization of the events, the laid back feel and the creative types of events that we run. Hey, but things do happen. Another reason people choose us because if an event does not go right for any reason, I always try to do the right thing. We are not a big company, but operated by me (Jay) and always will make time to listen and correct if anything did not go. The following are things to look for when choosing a singles event. If you visit the LongIsland.com Singles Events listings or look in Tuesdays Newsday, you will see that you have quite a few choices with respect to choosing a singles event. Unfortunately all singles events are not the same and it really comes down to the organizer of the event. Some have your best interest at heart, and others are just looking to make a quick dollar and do not put any time or effort into putting on a quality event. Here are some guidelines to selecting a speed dating company, but many of the criteria can be applied to general singles events as well. Does the company advertise more than one age group for the same night? This is a little trick that SOME (not all) companies play. They advertise two different age groups for the same night (e.g. ages 41-51 and 52-62), so you are led to believe two different events are taking place. You call up the organizer who says, yes we have 20 men and 21 women attending. Wow! this company must be good since they have that many people. Beware, because this may be a trick. Remember, two different age groups were advertised (41-51 and 52-62), but their is only one event taking place and the organizer is mixing everyone together. So the actual age group for the night is 41-62. You may be meeting 20 people that night, but the age variance is HUGE. Sometimes these groups are not intentionally trying to mislead you, it is just that they could not get enough people for both groups, so to make it seem like you are meeting enough people, they mix the groups together. When you see two age groups advertised for the same time on the same night, call the organizer and make sure that you get a crystal clear response that the age groups will not be mixed together. NO REFUNDS! : What does it say about a company who has these words on their website? Uh Hello, can you say they must have had many complaints. If an event is poorly run and you do not get your money's worth, you certainly should get a refund or be compensated fairly. Be wary of an organization who will not stand behind their service and do the right thing if an event goes poorly for whatever reason. *Does the organizer adhere to the age groups posted or do they have a policy of "If you don't tell, we wont tell." Their is nothing worse than signing up for an event only to find that the people attending are way over or under the age groups posted. That is false advertising. On the other hand, if you are looking to date outside your age group, a company that is not a stickler on the age groups may be an enticing option for you. Proof of age is required at WeekendDating.com events. 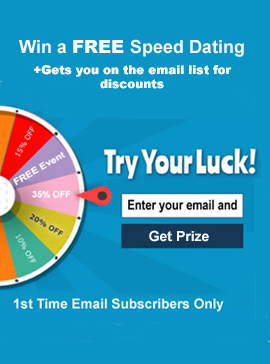 Do you have to enter in your own selections after the speed dating event? A night of speed dating can be very enjoyable, but also a little bit exhausting. Some companies require you to go home and enter in your own selections after the event. Other companies such as WeekendDating.com send the matches to you and do all the work. You may be saying Big Deal? Well it is a big deal since if you have to enter in your own selections, you may have to wait days to get your results or may not get accurate results at all. Why? What happens if you go home after the event and do your homework by entering your selections, but Jennifer waits a few days before doing hers? During those few days, you may be left waiting for the results to come in. What if Jennifer does not enter in the matches at all. Maybe she lost the paper, dog ate it, etc. You are left thinking that you really did not match, when in fact that may not be the case. When do you receive your matches? At our events, you receive your matches the next morning, many times within hours after the event. Some other companies also do a good job and send you the matches the next day. Others require you to wait 48 hours or more because they force you to enter in your own matches and can not start sending results until giving people a chance to input selections. Another company only provides the results to the men and not the women. Before making a reservation, find out how long you have to wait before getting your matches. Do you receive one way matches, meaning if someone picked you, but you didn't pick them, do you still find out? It can sometimes be overwhelming meeting a lot of people very fast, and you may change your mind. WeekendDating.com gives you one way matches as do a few other companies. Other groups do not. If this is an important feature, find out if the singles group provides you with one way matches. Do you get to meet EVERYONE at the event? Some companies such as Weekenddating.com structure the event so that you meet everyone who attends. However at other events, you only get to meet some of the attendees, but are encouraged to meet the others during a break period or afterwards. That can still be a little awkward. Does the company require pre-payment for the events? This is KEY. Ensuring an equal gender balance is no easy task. Although it is nice to just be able to show up and pay at the door, this system just does not work and consistently leads to a gender imbalance. Our events are only held on Friday, Saturday, or Sunday. Most other groups have events mid-week. Choose a company that has events during times that fit your schedule. How long is each date? I have seen everywhere from 3 minutes to 10 minutes, all depending on the philosophy of the company running the event. Our philosophy is to have you meet more people (no more than 20) for less time (usually 5 minutes). If you have an initial connection with someone, or are not sure after the 5 minutes, you can get to know the person afterwards or through email, but that important ice breaker has already taken place. Dating is a numbers game. Other groups have you meet 7 or 8 people for 7 or 8 minutes each, so you get a little more time with each person, but do not get to meet everyone. For some people, that works just fine and you should go with a group that uses that system. I am not saying that you should not give the new kid on a block a chance, but just be careful. The average company that hosts speed dating events is around for about 3 months. Try to find out if the hosting company is brand new, or has a history of canceling events because of a poor turnout. Food or any extras included? Some event organizers do include food at the events and others do not. If that is something important to you, find out if anything is included. Does the company have an updated website with a phone number to call should you have any questions? If there is not an easy way to get a live person on the phone should you have a question or problem, you may want to stay away. When you visit the website (if their is one), the events should be relatively current and not list parties from months ago.